I usually clean my kitchen good once a week, and then just wipe down little messes in the meantime. I think the most important rooms in the house to keep clean are the kitchen and the bathrooms, so if I don’t have time to clean the whole house, I at least clean those rooms. When my kitchen is sparkling clean, life just feels so much better! I don’t always deep clean my kitchen because I don’t always have time, but when I do have time, it is one of the best ways for me to feel like I accomplished something really good! When my house is a dirty mess, I swear it affects my mood, big time! Today I am going to tell you step by step how I deep clean my kitchen. Miss 16 year old has chores to do around here, and I have found that if I make her a detailed list of exactly what to do to clean each room in the house, she does a much better job! Seriously people, I worry about what her own house is going to look like one of these days! She is such a pig! Please tell me she is going to grow out of it and care about how her house looks! PLEASE!!! When I have cleaned a room and am feeling so good about it, she will walk in, and I will say doesn’t this room look so much better now? She will respond by saying, “I don’t even notice”. Seriously??? She swears that she does not notice a difference when the house is dirty or clean. That is worrisome! First I want to show you the basic necessities that I use to clean my kitchen. Be forewarned, I am a cleaning product junkie! Seriously, I have a problem. I also use microfiber rags to clean with (not pictured), and hot water. I start by getting out a new large black trash bag. I use it to dump all of the garbage when I am cleaning out the fridge and sorting through other odds and ends that are sitting around on the counters. The next thing I do is go through the refrigerator and pull out anything that is past its prime and dispose of it. I use my orange kitchen spray to do a good deal of the cleaning in my kitchen, and I always use a rag that is wet with hot water and rung out. I rinse it and get it hot again frequently. After I have emptied the refrigerator of everything that needs to go I use the orange spray to clean the shelves. If needed I remove the drawers of the fridge and clean them out with hot soapy water. After I dry them, I line them with clean paper towels and put them back. The next thing I do is go to work on the kitchen counters. I check the toaster to see if the crumbs need emptied and empty them if needed. If I am deep cleaning, I remove everything from the counters, one surface at a time, and spray with orange cleaner and wipe down with a hot rag. Then I wipe down everything that is on the counter with a hot rag and place it back where it belongs. Next, I move onto the stainless steel. I spray these things down with the stainless steel cleaner and wipe down with clean paper towels. I use the orange spray to clean the inside of the microwave, and I remove the glass plate inside of it and clean with hot soapy water. 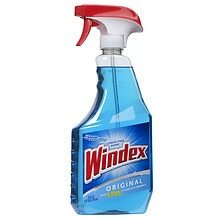 I use Windex to clean the inside and outside of the microwave door, the window of the stove, and the button panels on the microwave, stove, refrigerator,and dishwasher. I also clean the windows and glass door with Windex and paper towels. Next, I take the grates off of the stove and put them in the dishwasher, and clean the stove top with my gas range degreaser. I like this because it does a good job of getting burnt on crud off, and leaves everything shiny and streak free. Note: after I clean the stove top I take a dry towel and wipe it off, that helps with the shiny, streak free part. I then clean the lid and sides of the garbage can. I also wash and dry the dog’s food and water bowls. I save my kitchen sink as the last thing I do because I am constantly rinsing my rag with hot water as I clean. I then wipe down the outside of the cabinets with my hot rag. I usually use my magic eraser on any fingerprints on the walls woodwork, and doors. Sometimes I use it on the kitchen sink and stubborn stains on the counters too. When I am finished with all of this, I start on the sink. I use the barkeeper’s friend and a scrubby sponge to clean it. I spray it all down with hot water first, get the sponge wet, sprinkle the powder, and scrub away. Afterwards, I rinse it with hot water and wipe it down. Then I use the perfect sink on it. (my kitchen sink is stainless steel). It protects the sink with an invisible water repellent coating, kind of like rain x. This stuff leaves the sink sparkling like new! Now, I am finished with everything but the floor! I take everything out of the room, vacuum it really well, shake out the rugs really well, and then I use my Swiffer mop to mop it. Sometimes I use Pine Sol and hot water in a bucket, it just depends on my mood and how badly it needs cleaned. After the floor is dry I put everythign back in it’s place. I keep clorox wipes handy to clean up quick messes in between cleanings, and the scotch brite dishwashing wand is something I could not live without. I use it to wash dishes that I don’t put in the dishwasher, and even to clean out the sink in between cleanings. As far as paper towels go, I refuse to use anything but Bounty. There is no comparison, I use the white select a size. That is it! Dunzo! Now it is time to light some candles, pour a nice glass of wine, and stand there and bask in the glory you just created. If anyone tries to walk into the kitchen, threaten them within an inch of their lives! 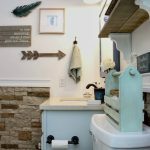 I hope reading how I clean my kitchen helped you out, and inspired you to go clean yours. Trust me, it will make you feel so much better! I can’t fully relax when I know my kitchen is a dirty mess. If you would like to see a tour of my kitchen in progress, click here. Here is a picture of it in case you have not seen it. Secondly, the Calphalon Tri-Ply stainless-steel cookware we gave my daughter and new son-in-law for one of their showers, and gave my son and daughter-in-law as a Christmas gift recommends using Barkeepers Friend to keep it shining like new. I'd planned to give them the cleaner too but didn't know where to find it or what it looked like. Thanks! Now I know. 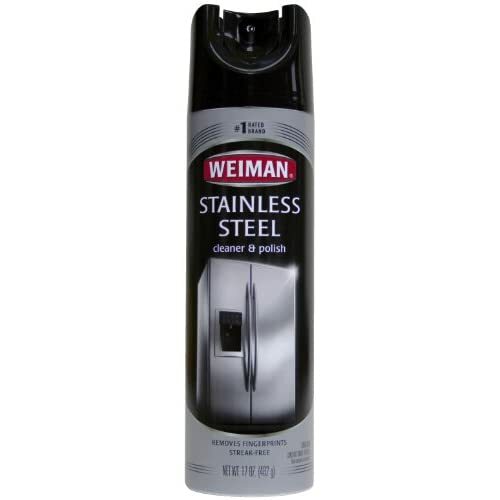 Do you use it on your stainless-steel cookware? Thanks! I always look to other blogs for inspiration, so it makes me feel really good to know I actually inspired someone else! I am actually planning on painting above my cabinets this weekend, and was thinking of changing things up a bot. I don't have a lot of storage in this house so keeping larger items on top of my cabinets is a must for me. I don't have stainless steel cookware, but I would love to! I have used it to clean my tea kettle, like you suggested though. I don't know why I never thought of it before!